Now I’d better own up before I proceed. I used to be a church junkie, albeit a slightly reticent one in my somewhat zealous youth. You see, I believed the evangelistic take on God and his kids. God is working in the world and His agency is the institution belovedly known as church. Back in my Irish homeland, as soon as one came into an experience of the risen Nazarene, one was instantly ushered into a sheep fold under the name of a ‘sound’ church. 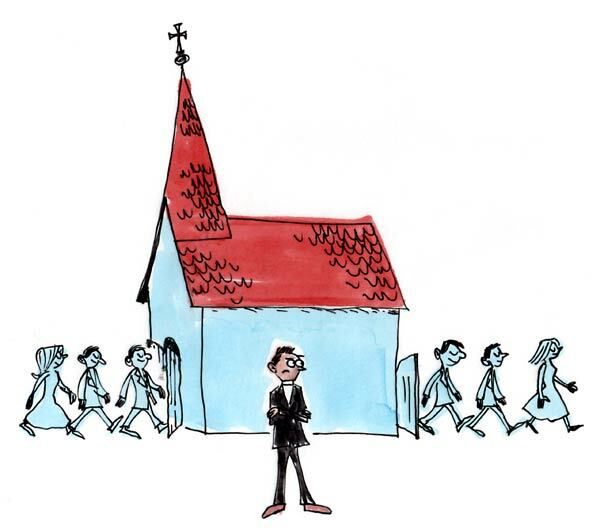 I was never really sure what a sound church was, for those who embraced the standard orthodoxy seemed to be asleep to me, the only sound being my snoring during the pastor’s sermon. No, for me it was a more radical version of Jesus community, or so I thought. I was a founding member of a Charismatic, (yes, speaking in tongues etc) fellowship that attempted to do things differently. I should have known better though, for all life-giving religious or spiritual movements eventually conservatise, becoming clones of their older predecessors. Northern Ireland was, and still is, peppered with man’s attempt to get Divinity into a box, much like any other Bible Belt area of God’s good Earth. That being said, I want to look at our fixation at growing a church, to use a trendy but ineffective term that’s doing the religious rounds. If one has a church, a group bang in the centre of Divine Will, then why not grow it – the bigger the better right! Well no, at least in my experience. Here are a few reasons for small is beautiful. 1) God isn’t obsessed by church like most of His/Her kids. Jesus groups were to be transient expressions of God realignment, not the be all and end all. Packed buildings of Jesus people on Sunday mornings aren’t on God’s agenda. 2) Spiritual life is best shared through conversation and friendship. The Nazarene hinted at this when talking about the two or three gathered into His name. When a few folk, with open and respectful hearts tune into the Divine in conversation, there is an opportunity for Presence to manifest and flow between those present. 3) Growing churches was never a Divine suggestion. Growing things is frankly more to do with market share than the Way of the Kingdom/Queendom. Institutionalised faith needs institutions and institutions need cash to survive. Once established, rigid faith groups frankly need bums on seats to keep going, and of course as we all know failure is never on the agenda for those believing God is with them. 3) Growth is an organic experience and one that is deeply personal. The numbers game in religious circles, patronisingly disguised as a concern for the lost, is nothing to do with true growth. Spiritual growth is the growing awareness of who we are, and our place in the Divine Heart. Such growth often follows times of great personal darkness. It cannot be manufactured on the assembly line of programmed religion. Rather it takes place in the desert of aloneness, when Light invades our Darkness. 4) Growth of our group encourages religious competition. I’m afraid I have to smile when a new church opens up here in Lincoln. The pastor priest will always claim to be in total harmony with the existing churches in the city. Their targets for membership are always the ‘unchurched’, especially the young unchurched who are susceptible to subtle, or not so subtle, love bombing. What often happens though is a case of sheep transference. When the shiny new religious stall is set out, Jesus people sniff out a better pastureland and hop the church fence to enter the new field of fellowship. And so it continues, throughout the ages. Like competing supermarkets, religious groups are in the marketplace of desire. the subliminal message is always this: ‘Our take on Jesus is more authentic than that of other groups, so come aboard!’. The merry-go-round world of church membership falsely feeds the growth dreams of model pastors/priests. We are getting new people so we must be fulfilling God’s agenda. 5) Big numbers inflate ego’s group identity. When we get high on our numbers, ego is lurking, willing to elevate us to a special status, that of God’s chosen. Growth is put down to God adding to our numbers rather than our clever marketing or manipulation of broken folk looking for answers. Ego, looks over its sacred empire and gives itself a pat on the back, while giving God all the glory, at least publicly. It’s empowering to be a member of a large and cutting edge group, though in time the ride will end in disillusionment and tears. It’s at this stage that God may get a chance to have a wee chat with us and bind up our self-administered wounds. While caught up in the church growth delusion we tend to see life as a life-saving operation. It’s a case of getting as many folk as possible into the Jesus lifeboat as possible before they check out of space-time. And as most of us know who’ve sailed the seven seas in such a craft, it’s really a delusion, for the boat of salvation is merely a church expansion programme. Divine Love has birthed all and will embrace all, church membership or not. To limit a spiritual coming home to joining a church is a big mistake. For often we leave the integrity of our God encounter at the door to play a different game, one driven by the need to belong and be accepted; a shinier version of the game that we played in our wilder days. So there you have it. Some wee thoughts why it’s best not to get involved with your church’s expansion drive known as evangelism. Since the days of my evangelistic zeal I’ve discovered that God is big, very big indeed. Faith groups are only part of a world that is loved, a Love without restraints that waits at the city gate for those with ears to hear to listen and respond. The Voice is everywhere, even, dare I say it, in the back pew of my old hemorrhaging church.